Imagine soft holiday spices wafting in from the kitchen and Christmas tunes in the air. Just the thought puts a smile on my face, and I hope yours as well. 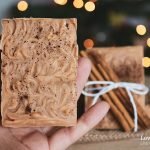 If so, I think you’ll enjoy my latest soap recipe and tutorial. It’s a natural Christmas soap made with a gorgeously scented essential oil blend and natural colorants. Cinnamon, ginger, citrus, with natural clay and spice to decorate. It’s also amazingly easy to create the swirly decoration on top. Over on Lovely Greens Handmade you’ll see a lot of Christmas scented products this time of the year, including the perennially popular Gingerbread Candle and the new Mince Pie candle. I wanted to make a handmade soap that matched so that I could give them out as handmade gifts. They can be used as an ordinary bar of soap or left out to sweetly scent the room (or Christmas stocking). 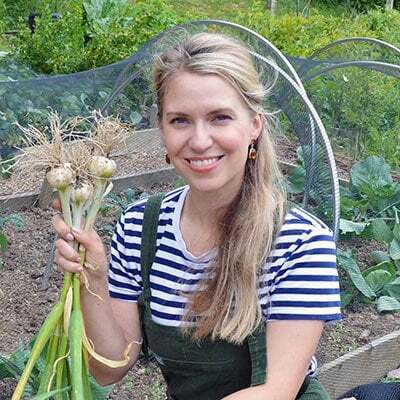 The oils I’ve chosen for this recipe create a beautifully hard bar with lots of fine lather. The main oils are olive and coconut and they’re joined by moisturizing shea butter and castor oil. The beeswax and cocoa butter used add their own warming scent to the essential oil blend. For color, we’re going to be using Red Clay and there’s just a dusting of cinnamon spice on the top for decoration. The scent itself comes from ginger, lemongrass, and cinnamon essential oils. Traditionally you’d use orange in a Christmasy blend but it doesn’t last very well in handmade soap. Lemongrass does its job just as well in this case. Before we get started you need to know a little about cinnamon essential oil. I think some people assume that just because an ingredient is ‘natural’ that it’s harmless. Not true, especially with some essential oils. 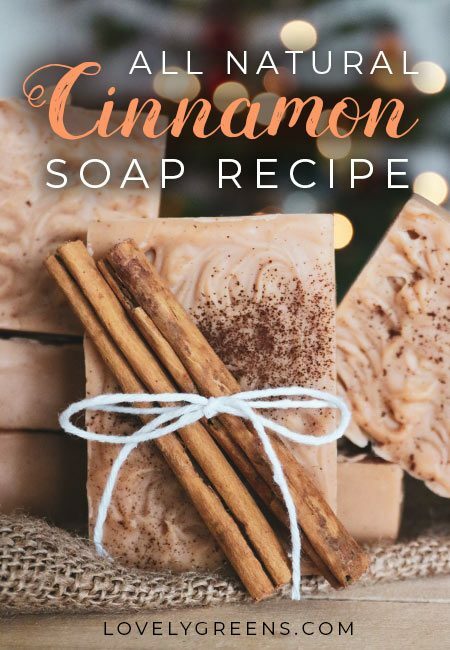 In soap, cinnamon essential oil can be a skin irritant and sensitizer. That means that people with sensitive skin may have a reaction to it, especially if you use too much. There are two main types of cinnamon essential oil and both should be only be used in tiny amounts. The more common cinnamon essential oil is derived from the leaves and twigs of the tree and it has a deep, spicy, and musky scent. The other type comes from the bark and smells more like the yummy cinnamon that you’re familiar with. Both should be used at 0.5% or less in any wash-off skincare product. 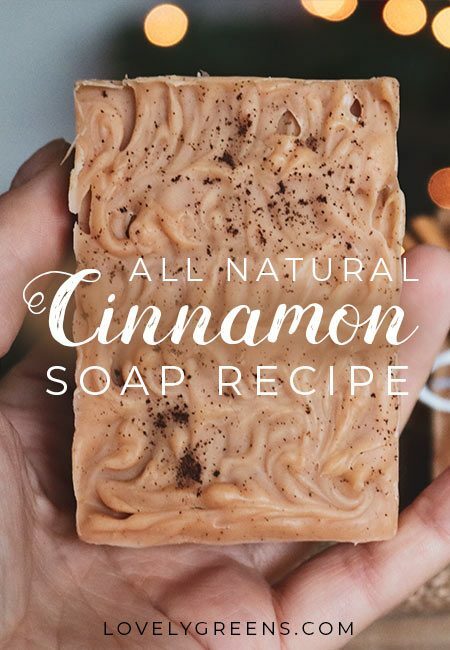 You’ll find more soap recipes using cinnamon leaf oil than bark oil because the latter is more dangerous. Using too much can cause skin irritation and it can even burn your skin if you use it un-diluted. That’s why you must be precise with how much you use and not add any more than 0.5% in your soap. When you make this recipe, please do not be tempted to add any more than what’s directed. Treat cinnamon bark essential oil like you would your lye water in this recipe – with respect. Always wear gloves when using it and avoid inhaling direct from the bottle since it can cause dizzyness. If you accidentally spill some on your skin rinse it off immediately with clean water. If you’re worried about using it, then just skip it altogether. Alternatively you can substitute it for a skin-safe fragrance oil that smells like cinnamon. They’re not 100% natural but may be easier to use. The spice cinnamon can be just as dangerous, believe it or not. Several years ago the Danes were worried that the European Union would be banning traditional Christmas cinnamon rolls. Based on food regulations they had too much cinnamon in them to be safe. I bet you’re thinking about that cinnamon challenge from a few years back now too. 454g / 1lb of soaping oils — makes six bars. 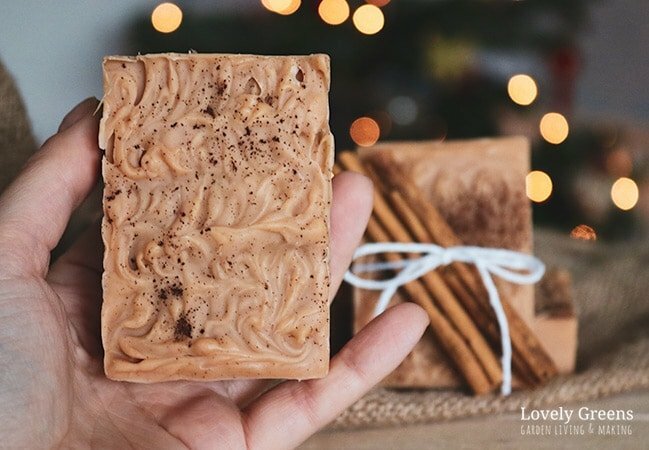 The total weight of this soap recipe with the lye and essential oils is actually 580g. For the cinnamon essential oil, use either types as described above as per personal preference. If you’re unsure about using cinnamon essential oil, don’t worry! You can also use a skin-safe fragrance oil blend that smells like cinnamon instead of the blend I provide. It’s not considered ‘Natural’ but may be a better option for you. Search for fragrance oils on websites in your region — I give some links to soap making suppliers over here. Bramble Berry has a few that you might want to check out if you’re in the USA. I always advise to get everything prepared and measured before starting to make soap. 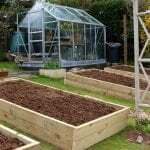 Get your equipment set out, measure out all the ingredients -- this includes the water into the heat-proof jug, lye into a jar, solid oils into the pan, and liquid oils should be in a kitchen bowl or jug. You should also be wearing closed toe shoes, a long sleeve shirt, hair pulled back, and wearing eye protection and rubber/latex/vinyl gloves. Soap making is chemistry so this step needs particular care. Making sure that you're wearing eye protection and gloves, pour the lye crystals into the water in a well ventilated place. Outdoors is best. Stir immediately and thoroughly with a stainless steel or silicone spoon until dissolved. Next add the clay powder and stir again until well mixed. 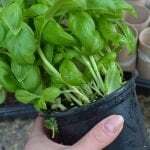 Allow to cool outside or place it in a basin of water to help it cool down. There will be steam and heat when you mix them together so be prepared. The ideal temperature for this recipe is 100°F / 38°C. Using a thermometer, or better yet a digital temperature gun, take the temps of both the lye water and the pan of oils. They should be within 10 degrees of one another and around the temperature mentioned. When the temperatures are just right, pour the lye water into the pan of oils through a sieve. It will catch any bits of undissolved lye or chunks of clay. Now stick blend. You're going to alternate stirring and pulsing until you reach 'Trace'. Trace is when the consistency of your soap batter is like warm drizzly custard. I’ve included a video at the bottom of this piece for lemongrass soap and it shows my technique for stick blending. Have a watch to see what to look for. When you’ve hit the right consistency, add the essential oils in and stir quickly but thoroughly. It will firm up fast. Next pour the batter into the moulds, spooning it in if you need to. To create the swirly pattern on the tops of your bars you’ll need a wooden skewer. Once your soap is thick enough to hold a peak you can begin working. Dip it into the soap batter in one corner of the mould and move it in tight circles like you’re drawing a spring. The end of the skewer should only be just below the surface of the soap. Finish at the other side and then repeat the pattern, but in reverse, all the way back. 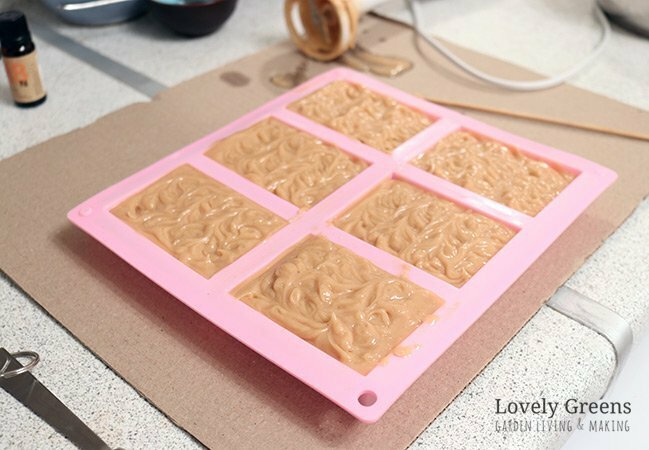 Sprinkle your soap with a touch of cinnamon (optional) and leave it in the mould for 48 hours. After that point saponification is complete and you can pop them out. Let the soap dry out for four weeks before using. This process is called ‘Curing’ and I have a great piece on what to do over here. If you’d like to give your soap as gifts, I also have some ideas on how to naturally wrap soap for gifts. I recently made soap with 2% white beeswax pellets, and noticed white spots on my soap bars when they started to cure. I’m wondering if I wasn’t supposed to soap at a higher temperature. Could you please advise me before I try this recipe? 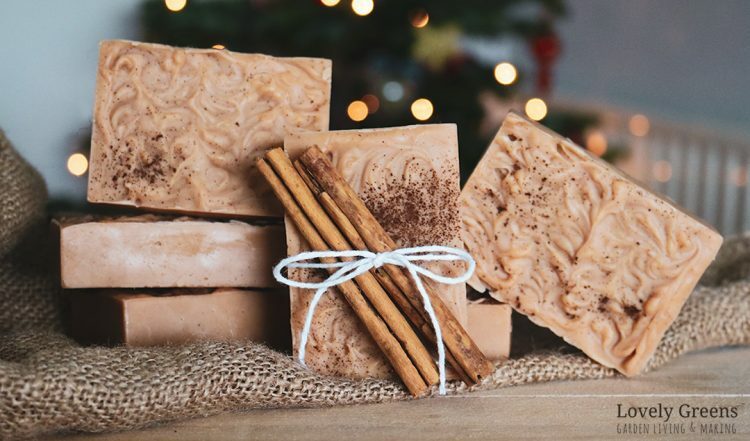 If you like the scent of real cinnamon then this holiday themed soap recipe is for you! I love the colour! And the essential oil combo sounds wonderful.